Lately the line between art and writing has blurred. It all started in my blog where my writing and photography came together. Three weeks ago I blogged about Jane Green’s novel, The Beach House. I had fun retracing her footsteps on Nantucket Island, where I spend time every summer. The author discovered my book review on-line and admired my blog header painting. Jane was looking for a special gift for her partner who loves boats and Nantucket. She ended up buying him “Nantucket Red.” Her partner will get the joke: Nantucket Red is a cloth originally made on island that fades to pink. It’s popular with sailors. I’ve never bothered keeping up with the latest trends. I’m short and hourglass shaped so shopping is a nightmare. Jeans need to be taken up inches in the rare case I find ones that fit. I like nice clothes but can’t understand why fashions change. I wear things until they have holes. My favorite item in my wardrobe are these retro flower power boots from Arche that even my daughter calls cool. My NYC friends call me bohemian. They say I can get away with it as a creative type. So the shoe fits, and it fits well in Maine. That is in the rare occasion I’m wearing shoes instead of hiking boots or flip flops. L.L.Bean’s headquarters are in Freeport, the next town over. Several of the moms I know work the holiday season shift in the factory. One friend of mine edits the catalogue. 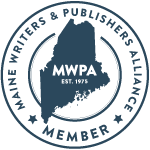 It was the contrast between small town Maine and my hometown of Manhattan that motivated me to start writing novels. After a year sabbatical in England, I’m writing a new book, NOT CRICKET, that puts two generations of Maine women at Oxford University. Fish out of water stories appeal to me. I don’t really fit in anywhere, and yet I look comfortable enough that strangers ask me for directions, no matter where I am. My agent, Jean Naggar, suggested that this lack of fit is part of what makes my writing good. It’s easy for me to stand back to get perspective. It’s also important to get perspective in art. Halfway through my "Nantucket Red" painting, I flipped it upside down. When I was finished (thanks for waiting!) a woman approached to question me. I explained that I have to trick the rational left hemisphere of my brain which sees a boat. When a painting is upside down, my artistic right hemisphere can see a composition and check for balance. It’s hard to see in the reproduction, but some red is worked into the seaweed and washed into the skyline. Red is the most difficult color to handle in watercolor. Other colors can be lifted off the paper with a sponge. Red stains like blood and mixes with green to make brown. I add the red last when the paper is dry. I don’t paint exactly what is there. I removed the extra sailboats. The balance improved when I shifted the seagull to the right, but then he took flight. I had to paint him from memory. The sailboat kept swinging around its mooring. I was working on a boat launch beach halfway between Jetties Beach and the Brant Point lighthouse so there were people dragging dinghies past me. Mosquitoes were buzzing. The painting looks so peaceful, but the process was turbulent. I still feel calm looking at it, remembering the beauty of the island. When novelist Jane Green bought this painting, I was thrilled but somewhat disconcerted. It felt like my two careers had flipped. Was Jane a fellow writer or an art client? I learned that my agent co-represented Jane for her first book sold in the USA. Jane is English but now lives in the USA with an American, the reverse of me and my husband. I've gotten to know Jane a bit through our blogs and e-mails, and she's really nice. Our lives are like a reflection with the line between us blurred. My art career is coming into sharper focus. 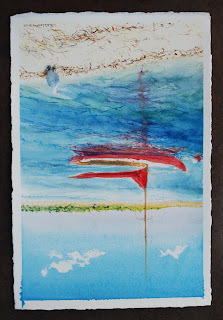 I’ve added pages of watercolors and photos to my website. I've already had another inquiry about the "Nantucket Red" painting, but I don't sell duplicates (although I retain reproduction rights.) Watercolors look best in the original form. This week the on-line journal nantucket-art.com posted a feature on me. Check it out. It’s a great way to get a sense of the art scene on the island. The journal is written in blog style. 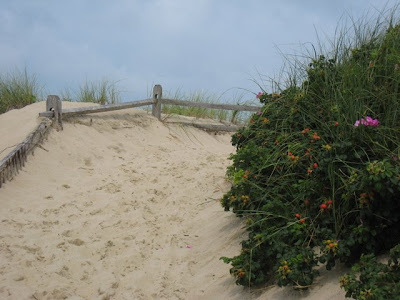 Answering Nantucket Art’s questions, I found myself mentioning my writing too. An artist is the protagonist of my work in progress. It’s fun to be writing about art, to bring those two sides of me into one character. In fiction there need not be borders. Sarah, it's no wonder you seem so balanced and grounded. You have been blessed with gifts from both sides of the coin, and it's paying off for you. I like that image of sailors in pink. The sailors in my mind, though, are the wiry, weatherbeaten kind. They are heading home from a hard day's work hauling in fish nets for a few pints and laughs with the barmaids at the tavern. I am really looking forward to reading your bookj when it comes out.Should you need inspirational pics of village cricket (in whites) I have a gazillion of them! I once took a coffee table book out of the library('Nantucket Style' I think it was) with shots of Nantucket homes, and I fell in love with the place. It is not the fact that you can stand back and see perspective in your writing, it is the fact you express it so well that makes people feel they are there. You include us all and write eloquently. I hope Not Cricket does very well. If you think of it, can you email me when you get the chance? Good post and congrats on selling your art and being written about. I have a funny story about the famous LLBean boots. They really came into style when my kids were in high school and younger. They advertized that they could fit anyone. One day I took Tina out to get a pair and we spent the better part of the day with a clerk TRYING to fit her in a pair (better, being an oxymoron for sure). Ended up after what seemed forever, the clerk decieded, with Tina's very small feet and high instep, he could not fit her. We went to a shoe store and got her fitted in a look alike pair of boots, that fit. I noticed after that the "we can fit everyone" was no longer in the ad. That is a lovely story, Sarah. And congratulations on the feature story! W2W, sometimes the balance is a bit wobbly, but thank you. I’ve haven’t run into weathered fishermen on Nantucket, but the lobstermen of Maine sure fit that description. Thanks PG, I’d love some cricket photos. I’ll get in touch. The only cricket team I spotted in whites this past summer were having tea on china. That actually would have made a good photo too. You’d love Nantucket. It’s storybook land. Thanks Tina, that is the best thing you could have said to me today. I know you’re commenting about my blog, but I can’t help thinking about my novel. I was stuck on a passage in chapter 2, and now I realize what was missing: more description to transport the reader to the scene. I did e-mail you early this morning to the address on your blog. Did you get it? Jean, thanks for sharing that funny Bean boot story. They don’t fit my feet either. I have a pair of Swedish hiking boots. Jane, it would be worth throwing a party just to see the outfit you’d pull together to compliment those Bean boots. I remember now that you’re a gardener. I should stop day dreaming about book parties and write my next book…. JAPRA, thank you. It’s been a happy close to my painting season. Although if this gorgeous weather holds, I’m tempted to sneak out and paint another day. All, the kids and I are going out for gelato (yes, even in Maine!) and then I’ll catch up on your blogs. I love my Wednesday blog days. For those reading RSS feeds, I just republished to fix a link. It’s the same old post. Sarah, I loved this post and love that you are aware of your different talents but not ambivalent about them. Why not do both? You go girl. My husband is on his second pair of LL Bean boots. I feel like writing to the good people in LLBean HQ that if ever they wanted a model for the product in the UK he would be it. Congrats on the painting and the story. Mom, Yes I do remember! Had to be in style I did. I finally found a pair, secondhand of course but they work. Never wear them though. Sarah, I did not get your email. It is ramseytina5@gmail.com. The one on the blog should work, not sure why it isn't. Please try again. Audrey, either that or I’m totally indecisive. I always thought L.L.Bean would do well in England; there’s mud in common. Years ago I bought a Barbour in England. My English in-laws have gortex raincoats from Lands End. You are quite fortunate to have both sides of your brain functioning well! My husband and I joke that between the two of us we have no left brain at all. Congratulations on selling your beautiful watercolor, and to someone whose book you enjoyed so! That must feel wonderful! Like Gretel, I'm looking forward to your own book soon! Pamela, my art is going to a loving home. I couldn’t be happier. Isn’t Gretel sweet to share her cricket photos? It’s fun to be working on a book that will appeal to both my American and English readers. Others too. I guess I’d better write it! Does "bohemian style" mean that you mostly wear black clothing? The good thing about eschewing fashion is that you are arguably never "out" of fashion! Having flexible perspective (whether in painting, literature, or cultural judgment) can only be considered a big plus. As always, reading this post was a pleasure . 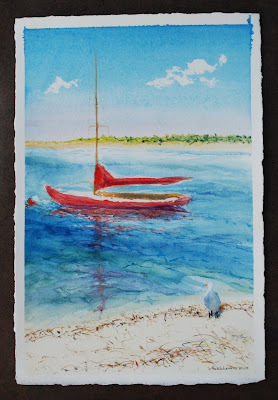 . . and I envy Jane Green her "Nantucket Red" picture. I've always wondered if an MRI would show that the right side of my brain is TINY--I'm always amazed by visual artists because I can't draw or paint or sculpt at all--something doesn't translate. Nevertheless, I love (and understand) that you flip your paintings--and the results show. Cosmo, I doubt it. Your beautiful garden is proof of some fertile right brain activity. People just have different ways of expressing the creative. Sarah ~ I always look forward to your posts, they are so well written. And I always learn something! That's very interesting how you flipped your painting upside down to get perspective on it. It doesn't hurt to look at things unconventionally. Cindy, how nice to hear that. The upside down image drove my husband crazy. Lovely sail boat picture and I loved the faded red hats. Faded red is so amazingly chic. I'm currently in England and lapping it up - beautiful late summer/ early autumn weather - needless to say with lots of 'healthy' walks. Elizabeth, how nice to hear from you in the home country. England is so nice at this time of year. I love that you’re still blogging on vacation. Enjoy your visit! Sarah,I like those retro boots! As I get older, I realize that keeping up with fashion is a waste of money. Your watercolor is beautiful, and as always, I appreciate the story behind its creation. How wonderful that you found a buyer through blogging! I think you have us all intrigued about your book; I'm looking forward to reading it when you have finished it. Sorry I haven't been around for a few days; computer problems are making blogging a challenge this week. Rose, it’s never made sense to me why I should abandon something I love after wearing it one season. It’s fun when blogging, art and writing all come together. It really helps to get encouragement. With practice novels get easier to write, but beginnings are always tough. Good luck with your computer! Hi Sarah, I love your blog. It makes me feel like I'm getting some culture when I read it. New England is my home and I love seeing different parts of it through other people's blogs and pictures. I'm going to put this on my "Blogs to Follow" list. It's very cool that you're an author! Donna, welcome to my blog. I’m an author in the works as my agent is looking for a publisher for my books. I see that you’re a copy editor so you know the process. You’re one step ahead of me on “blogs to follow” know-how. Thank you! How exciting! I loved hearing about your painting process. So fascinating. Your art is stunning! Thanks Alyson. I'm already mourning the end of my painting season, but I'm on a roll with my next novel. At least I still get to write about art. Nice to have you back in cyberspace again. 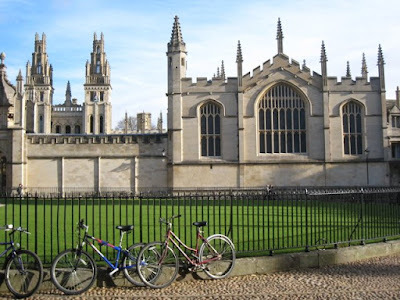 I visited Oxford once and found it more charming than Cambridge, save the differences. I love the header on your blog, excellent painting. I look forward to reading your novel, partly because I am a NO CRICKET type of man. Thanks ACIL! I do miss London and Oxford, even Cambridge too. I so enjoyed reading this. I'm glad I found it. Shauna, welcome to my blog! I enjoyed reading yours too. My daughter and I are both very short!!! We have finally found that Lands' End clothes are best for us. They will hem up any pants free for her, and my 14 Petites are just right for me! The Pima ( Supima? )tees last for years without fading. My 7-year tees now are needing replacing! If I can't wear a pair of slacks and a beautiful tee, I don't go! Cheers from an old lady who loves being old!!! Cheers! Like your blog!